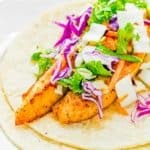 These Spicy Fish Tacos are quick and easy to prepare. They're delicious enough for a weeknight dinner and tasty enough to please everyone! This recipe is simple, yet so delicious! 1 lb fresh mahi-mahi fillets. You could use any other white fish in this recipe like tilapia or cod. In a small bowl mix the salt, peppers, garlic, cumin and paprika. Reserve. Cut the fish fillets into strips, about 1 inch thick. Season the fish with the mixture of salt and species (be generous). Heat the oil in a large skillet over medium-high heat. Cook the fish for 2 -3 minutes each side or until golden and cooked. Heat the tortillas: Place the tortillas in a clean skillet over medium heat and cook them for about 30 seconds on each side. Or to save time place 4 tortillas on a microwavable plate and wrap them with a damp paper towel. Microwave in 30-second bursts until they are warmed through. Repeat in batches of 4 tortillas until all your tortillas are warm. Place two strips of fish on each tortilla. Add coleslaw to your liking and spicy cilantro and lemon mayonnaise, if desired. Do not cut the fish into strips too thin or they can break apart when you cook them. I used store-bought cabbage-kale salad mix.